On the dark and bloody battlefields of the Warhammer 40k universe few enemies incite more dread than the merciless Chaos Space Marines. Spreading terror and destruction in their wake, they have fought against their hated Space marine brethren for a millennia. The Iron Warriors are brutal even amongst their chaos counter-parts and are unsurpassed in the art of siege warfare. They have turned their attentions to the Imperial citadel of Hydra Cordatus, laying siege against it's mighty walls. But what prize could possibly be worth so much savage bloodshed and destruction and how long can the defenders possibly hold out? 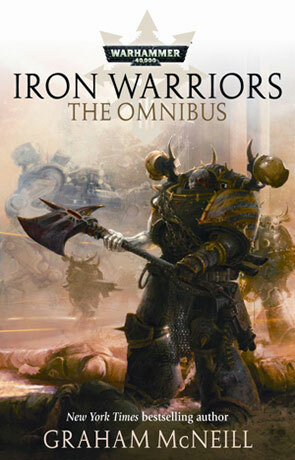 Iron Warriors collects the novel Storm of Iron, novella Iron Warrior and the short stories The Enemy of my Enemy, The Heraclitus Effect, The Skull Harvest, The Iron Without and The Beast of Calth. Storm of Iron introduces us to the now infamous Warhammer 40k character Honsou the Iron Warrior, a champion of the Warsmith who is often looked down upon due to his "half-breed" status - his gene-seed is a meld of Iron Warrior and Imperial Fist (The Imperial Fists being the originating chapter before the Horus Heresy). One of the great things about this book is the way that it manages to get you rooting for the bad guys, don't get me wrong there are some real imperial guard hero's (Julius Hawke being one of the key characters) and these are well fleshed out and heroic in just the right ways but the characterisation of the Iron Warriors - especially Honsou, is such that you can't help but want them to win. I think part of the reason for this is that it's clear that Honsou clearly has a spark of humanity still within his Chaos warped shell, and even though he is a Chaos Warrior he is one that hasn't been completely subverted by blood-lust or power. It's very rewarding to read a novel that focuses on the bad guys to such a degree and yet still manage to create great heroes, there are too few novels that put such focus on the other side of the coin and I'd love to see more. McNeill isn't afraid to kill off any of the key characters when the need arises either, which is somewhat refreshing and liberating. The real star of the show though is the siege battle itself, it's simply incredible with tight descriptive dialogue and tense, graphic and dramatic fight scenes that keep you absolutely glued to the pages. The pace is probably best described as "frantic", it doesn't let up for the whole duration of the novel with pretty much non-stop action. As such it's actually a pretty fast read and this includes the novella and short stories too. The novella "Iron Warrior" and the short stories that make up the rest of the Omnibus are just as well written however they also closely coincide with events in the Ultramarines series of novels and as such if you are unfamiliar with these novels (available as 2 omnibus editions) then you may find it a little confusing. I for one just loved how these two stories intermingle with each other and it's a mark of the author managing to get this to work as well as it does. Regardless of your knowledge of the Ultramarines the novel Storm of Iron can be enjoyed just as much though, so don't let it put you off. The Iron Warriors is a seriously good anthology, fast, brutal and fresh, managing to show the darker side of an already dark universe without alienating the reader. Written on 20th April 2012 by Ant.